On the 25th of October, the kids at Salaam Baalak Trust enjoyed a lot with Toybankers. We conducted fun activities for the children and also distributed toys to 100 children there! 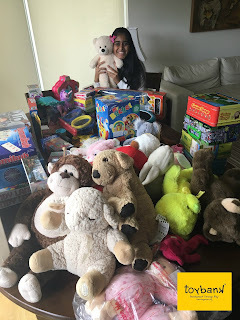 Shruti: The volunteers of Toybank had organized a ’Best from Waste’ activity for the kids - and lo! – We were in for a surprise! Not only did the kids amaze us with their superb craft skills; but compelled us to introspect. It does not take more than a second for us to throw away the junk/ scrap as trash. And here are these kids, little genius people making wonders out of them! Wall hangings, photo-frames, sofa-TV set, pen stands… the list was endless. What astounded me the most was the fact that a discarded piece of netted cloth, sequined and laced could actually be turned into a cake! To say that the kids were super imaginative would be an understatement- they were incredible! The three hours we spent with them were up in no time! Snap and gone! The activity ended with gifting ceremony, wherein every child was given a gift – a precious toy! It was indeed the happiest moment for the kiddos- the smiles on the kids faces vouched for it. And like all good things should come to an end, the event too ended with a vote of thanks from one of our Toybanker – Shruti Shetty and the coordinator at Salaam Baalak Trust, Ms. Agnes! 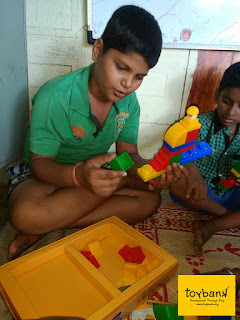 Shruti Oza: It was really wonderful experience for me to guide the kids to make creative items out of waste. The children are really smart and filled with bright ideas. Toybank is doing great work by conducting such events which trigger the creativity within the kids! "The event on 25th of October was a success organized by the Toybank. We had divided the children into two groups of junior and senior children. Toybank had planned two activities for both the groups. The juniors had the activity of making a collage out of magazine sheets. The kids were divided into groups of three and it was a fun activity as every step they completed they were more excited. The younger kids were given soft toys after the activities and they were really overjoyed as it was something they love to play with. Also as it was gift wrapped, they felt quiet special after receiving it. The seniors had to make something creative out of waste and scrap materials. Toybank had provided all the material for the entire workshop. One volunteer accompanied each group and they came up with wonderful creations. The amount of excitement filled in the kids was at a high level as the activity was very interesting and also needed them to stress their brains and do something new. It created an excitement in them as few of them interested in art and craft were able to show their talent and creativity. One of the important aims I found of this activity was group building and team working. They had to work hand in hand with each other to reach the next level and complete their creation. The senior children received different toys and games according to their age levels and they really were overjoyed. Toybank gang reaches out to children in Turbhe! A real tribute to Chacha Nehru!